Posted on Mon, Apr 26, 2010 : 9:57 a.m. The "Poor Man's Pepper" plant, found at Barton Dam this weekend. Part of the fun of foraging is the unexpected and surprising tastes you can find. All those look-a-like simple green plants, blending together into the landscape -- who would guess there are such divergent tastes and smells amid the green? And the “Poor Man’s Pepper Plant,” Lepidium virginicum, is a surprise: spicy, peppery, tangy and bursting with flavor. 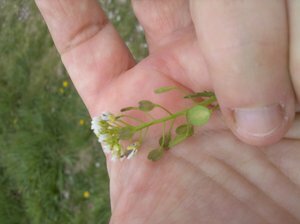 A small common plant found in open fields and the edge of the woods, this peppery tasting plant is currently in flower and so a bit easier to spot. I found it growing next to some mustard with bright yellow flowers; I might have passed it by otherwise. The tiny white flower also has some spice, and it is yet another flavor and color you can add to a salad or as an edible garnish. It isn’t sweet like so many other flowers. The flat circular seed pods that are the most peppery part of the plant are available now until fall, and sometimes can be found mid winter. You can eat them as is, or dry them and grind them. Last year a friend gathered a lot of the seed, let it dry, and ground it with wild mustard seed and vinegar to make a spicy condiment. It was very unusual,and pretty tasty. But the seeds are not prolific; they grow low to the ground, so you have to do a lot of bending, and you don’t get a lot from your efforts. Not even a lot nutritionally. Why bother? Well, just finding and nibbling on your walk is fun, especially if you can share a variety of taste sensations with someone else who is new to edible plants. Foraging attracts do-it-yourself types, and this is a local source of pepper substitute. So if you want to make your meal even more local and personally harvested, it adds variety. And the ultimate non-answer? Because it is there. For much better pictures and descriptions of this simple plant, Wildman Steve Brill has it on his Web site. Linda Diane Feldt is a local Holistic Health Practitioner, Herbalist, Teacher and Writer. You can follow her on twitter, check out her Web site, and in May and June sign up for weed walks to see and talk about the plants in person. She also offers free monthly herbal wisdom classes through the People's Food Co-op, the next class is Thursday, May 27.